A key takeaway from our latest State of the Nation’s Housing report is that poverty is both increasing and becoming more concentrated across the country. Moreover, while a third of the poor live in high-density urban neighborhoods, the number of poor people and poor neighborhoods grew particularly rapidly in the “exurbs,” low-density neighborhoods on the fringe of the nation’s metro areas (Figures 1 and 2). According to the report, from 2000 to 2015, the number of people living below the federal poverty line rose by 41 percent, from about 33.8 million to 47.7 million. Additionally, the number of high-poverty neighborhoods (census tracts where the poverty rate is 20 percent or more) rose by 59 percent, and the poor population living in these areas increased by 76 percent to 25.4 million. 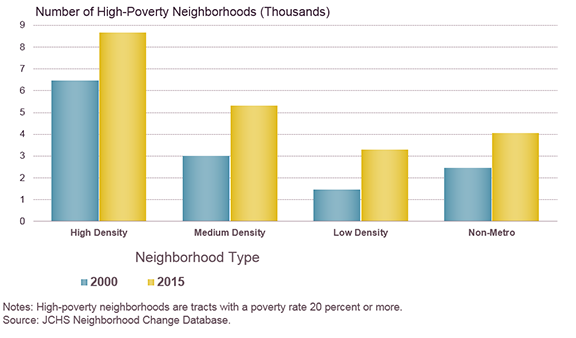 As a result, 54 percent of the nation’s poor now live in high-poverty neighborhoods, up from 43 percent in 2000. The growth in high-poverty neighborhoods was widespread, occurring in all but three of the nation’s largest 100 metros (Honolulu, El Paso, and McAllen, TX). 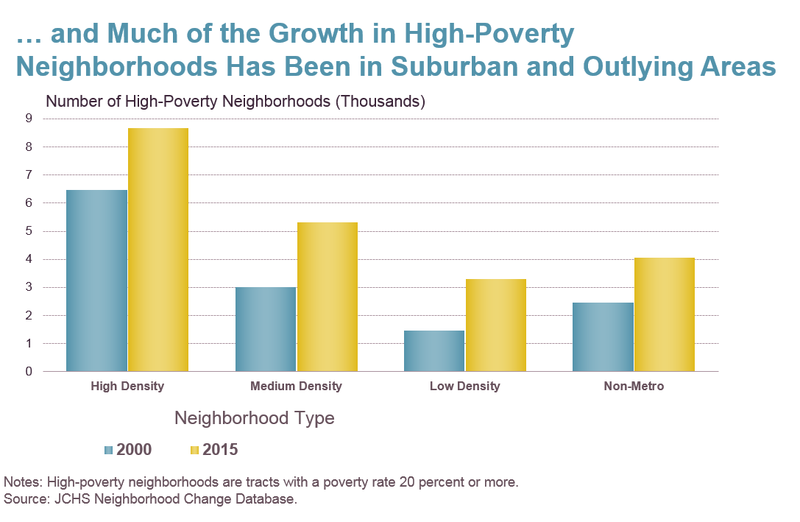 Moreover, the rise of poverty was particularly rapid in the exurbs, where the number of high-poverty neighborhoods more than doubled between 2000 and 2015, and the number of poor people living in these neighborhoods grew by 164 percent, rising from 1.5 million in 2000 to 3.9 million in 2015. Such growth presumably was due to the fact that housing generally is less expensive in these areas, but the savings in housing costs are often offset by higher transportation costs and more time spent travelling to work and other activities. 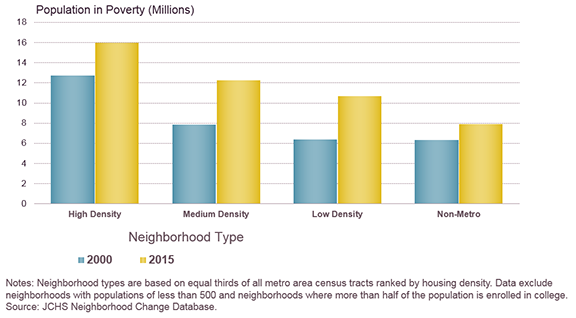 Our new interactive chart shows that these changes were not uniform in the nation’s 100 largest metropolitan areas. 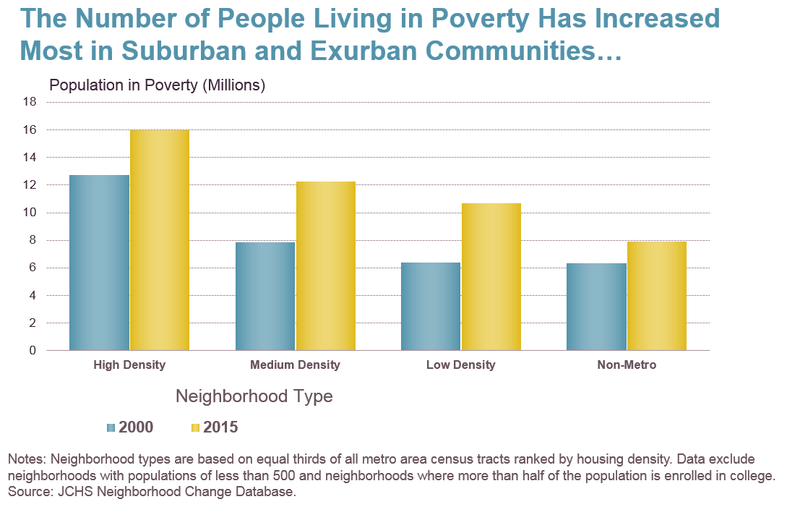 To begin with, two-thirds of these metros underwent a rise in concentrated exurban poverty from 2000-2015. Moreover, the magnitude of the increase varied. For example, the number of high-poverty, exurban tracts increased more than tenfold in the Detroit, Greensboro, and Cape Coral, FL metros, and increased by a factor of five or more in 11 other metros, including Atlanta, Denver, Charlotte, Cincinnati, Kansas City, Las Vegas, Nashville and Orlando. Other large metros where the number of high-poverty, exurban neighborhoods more than tripled included Baltimore, Philadelphia, Pittsburgh, Portland, St. Louis, and Tampa. 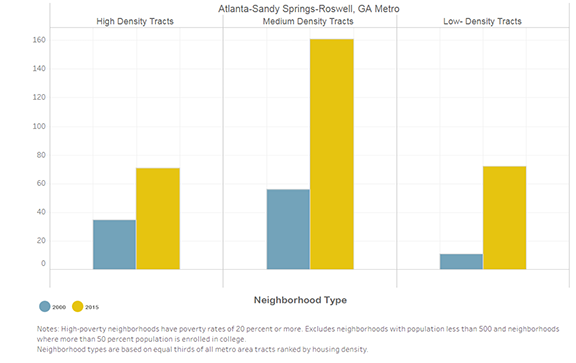 For example, in the Atlanta metro, the number of low-density, high-poverty, exurban tracts rose from only 11 in 2000 to 72 in 2015 (Figure 3). 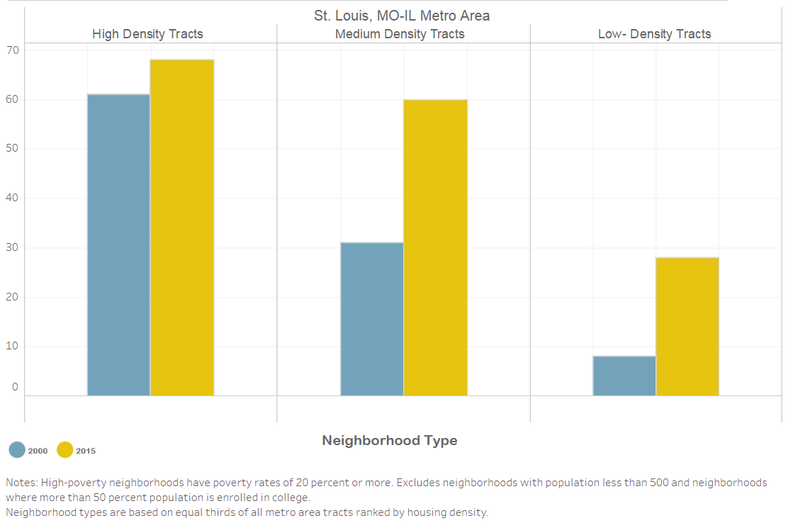 Meanwhile, in the St. Louis metro, there were 28 high-poverty, exurban neighborhoods in 2015, up from 8 such areas just 15 years earlier (Figure 4). While poverty remains highly concentrated in dense urban areas, several large metros now have unusually large shares of high-poverty, exurban neighborhoods. 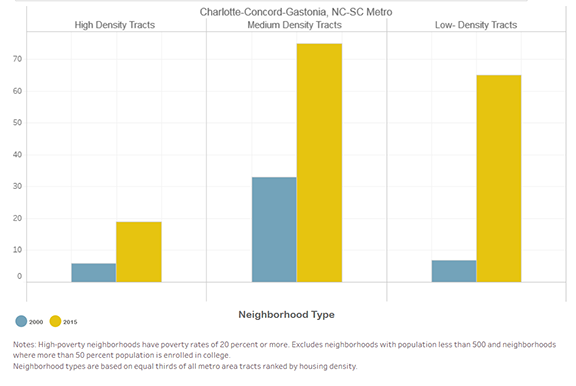 In the Atlanta, Charlotte, and Nashville metro areas, for example, nearly a quarter or more of all high-poverty neighborhoods are located in low-density, exurban areas. Poverty’s shift to lower-density areas was especially pronounced in the Charlotte area, where 41 percent of high-poverty tracts are now situated in low-density, exurban areas, up from just 15 percent in 2000 (Figure 5). 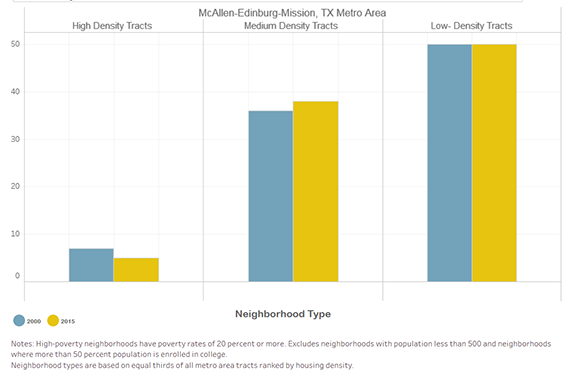 Moreover, in several smaller metros across the South – such as Columbia, SC; McAllen, TX; Greenville, SC; Jackson, MS, and Knoxville, TN – well over half of all high-poverty neighborhoods are located in low-density, outlying regions (Figure 6). Use our interactive tool to see the change in high-poverty neighborhoods in the nation’s 100 largest metro areas between 2000 and 2015. Download Chapter 3 of our State of theNation’s Housing 2017 report, which contains additional discussions on the growth of poverty and the spread of high-poverty neighborhoods.